Using the registry from the DEO, Cadmus begins finding and kidnapping innocent alien civilians. Eventually, the group even attacks the alien dive bar, kidnapping Lyra, much to Winn’s dismay. 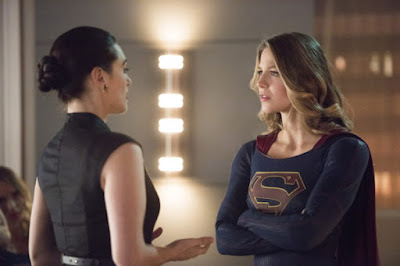 To inform the public on the kidnappings, Kara attempts to get convince Snapper Carr to publish an article, but he refuses to work on the story, even after an exclusive interview with Supergirl, without naming the DEO as a source. Though the DEO continues to search for Cadmus, J’onn takes Alex off the case after she proves to be too personally involved following her father’s betrayal. Nevertheless, she works with Maggie to secretly find the Cadmus location where she ultimately confronts Jeremiah once again. There, she discovers Cadmus’s latest scheme is a forcible mass exodus of aliens to a farther part of the galaxy past Earth. Fortunately, Kara learns the location from Lena discovering an active former L-corp site. With Jeremiah’s help in fighting off Hank Henshaw, Alex infiltrates the ship and helps many of the aliens to escape, but the ship prepares for its launch. With Supergirl’s efforts, they successfully stop the ship from reaching light speed and leaving the planet, successfully rescuing all the alien captives. Unfortunately, Kara publishes her article publicly on the Internet against Snapper’s permission which causes her to lose her job at CatCo. However, Alex manages to regain her position in the DEO after regaining J’onn’s trust with her investigation. As Kara and Mon-El spend a night together, a ship enters the atmosphere where a man and a woman passenger remark on their new strength in this world, their main destination. Teri Hatcher, who previously played Lois Lane, appears briefly at the end of the episode. The Flash "The Wrath of Savitar"
The STAR Labs team help Barry and Jesse train Wally to confront Savitar. After a successful run, Barry and Iris announce their engagement to the others. Unfortunately, when Wally runs out in the field, he is confronted with a vision of Savitar, leading to fears that he may return. Julian, convinced by a kiss from Caitlin, allows himself to be used to communicate with Savitar once again where they learn about the location of another piece of the Philosopher’s Stone. Barry finds the box he originally threw into the Speed Force in the hands of the acolytes while Wally continues to train. In his frustration, Wally convinces Cisco and HR to give him a vision of the future. From the vision, Wally deduces that Barry only proposed to Iris in order to change the future, leading to an upset Iris to question her and Barry’s future. In the midst of their trouble, Caitlin reveals to Julian that she secretly kept part of the stone. Julian alerts the rest of the team to this presence of the stone, allowing them to discover that Savitar can still return. With another talk to Savitar through Julian, Barry discovers Savitar is possibly in Central City. Wally later sees a vision of his mother until he realizes it as a trick from Savitar. Wally races off to stop him just as the group discover the stone to be missing. In the city, Wally opens a portal to the Speed Force where he is sucked in, leaving an opening for Savitar to escape. Barry fights off Savitar evenly until Savitar stabs Barry in the chest. Fortunately, Barry manages to break off Savitar’s weapon, giving him enough time to return to STAR Labs for help. The rest of the team help patch up Barry, but the mood of the group is sour with no knowledge of how to find Wally. Savitar reveals that HR survives in the future. 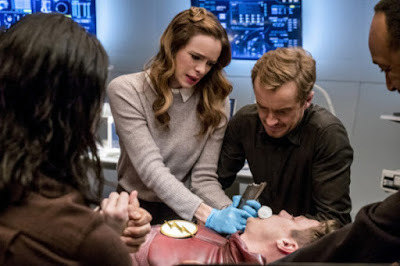 Caitlin and Wally seem to fulfill part of Savitar’s prophecy as Caitlin betrays the group by keeping the stone and Wally disappears into the Speed Force. Legends of Tomorrow "Land of the Lost"
Rip regains control of Gideon and forces the ship to crash in the Crustacean period, millions of years in the past. With a necessary piece lost in the area, Ray, Nate, and Amaya go out into the wilderness in order to salvage it and leave. Meanwhile, Sara, Rory, Stein, and Jax are left with Rip when Rory suggests to go inside of Rip’s mind to get through to their friend. 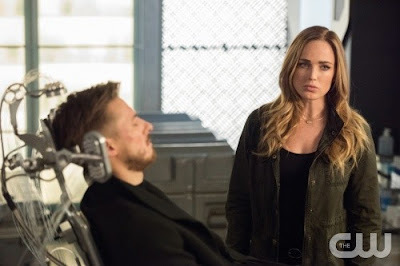 Sara and Jax then hook up to Gideon and are transported inside Rip’s mind where they find a more sinister version of the Waverider and evil doppelgangers of their teammates waiting to fight them. After fighting off many obstacles, Jax comes across a personified version of Gideon while Sara locates the real Rip, trapped inside the illusion of his mind. Outside the ship, Nate and Amaya seem to grow closer, though Ray warns Nate about Amaya’s future to pass. After getting through to the real Rip, Rip is able to fight off the evil versions of the team, allowing Sara and Jax to return to the real world. With their friend returned, Rip retakes control of the ship and offers to share with the team the location of the final piece of the Spear of Destiny, now being guarded by Nate’s grandfather Commander Steel. After confronting a T-Rex, Ray, Nate, and Amaya return to the ship with the missing piece. Although Nate maintains feelings for Amaya, he attempts to pass them off, knowing the importance of maintaining the timeline. In 1970, Commander Steel goes undercover as a pilot going through an examination to be part of the Apollo 13 space mission. However, his doctor under examination is revealed to be Eobard Thawne. Ray previous stayed in the Crustacean period between seasons one and two. Ray references Amaya’s granddaughter Mari whom he met in season two of Vixen.